Matera in the sweltering heat of summer. All photos by Jeralyn Gerba. An isolated and mysterious ancient cave city comes to life through high design, good acoustics, and evening strolls. Popupla editorial director Jeralyn Gerba finds the romance in it all. 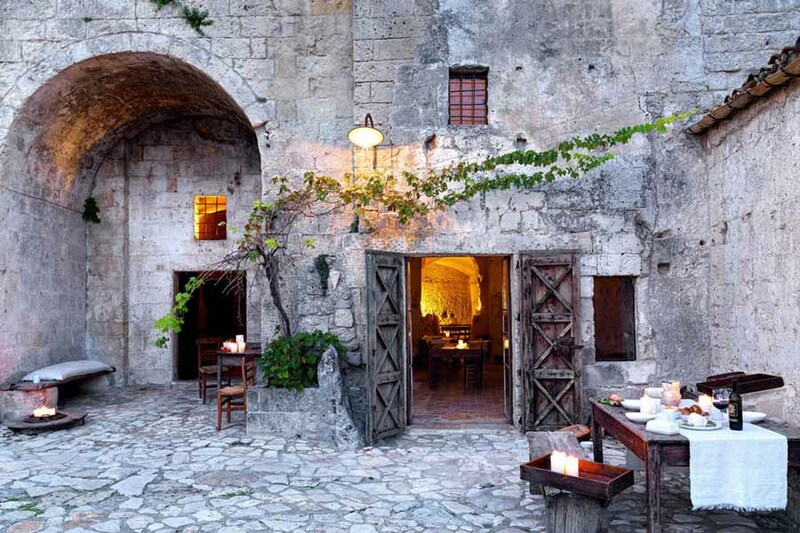 MATERA, Italy – I am handed a set of medieval-looking iron keys and led to a small wooden door which opens to a stone cave: my hotel room for the weekend. It's minimalist and beautiful and deliberately rustic with dramatic accents that have me swooning. A bowl of stone fruit on a wooden desk. A bed draped in white linen. A packed earth alcove leading to an egg-shaped bathtub and crystal decanter of bubbles. My husband and I booked on a whim after reading about it while vacationing on the Amalfi Coast. One insanely expensive car ride from Sorrento later, we arrive at the southern reaches of Italy (the instep of the boot) to Matera, an ancient city of caves. It's an impressive looking place, a bleached-out mass of stone straight from the Bible. Zig-zagging stairways and corridors pile on top of one another. 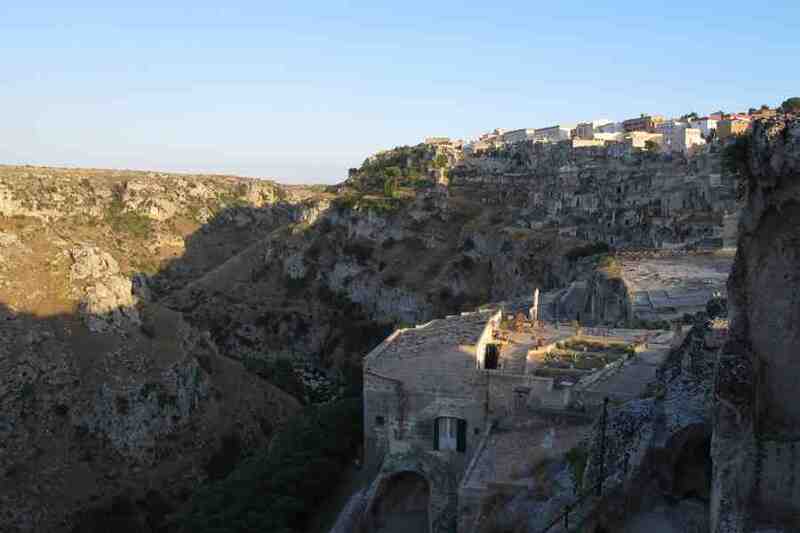 The whole thing teeters on the edge of a canyon carved away by a stream called the Gravina. At the center is the prehistoric settlement Sassi, where cave inhabitants are suspected to have lived since the Paleolithic era. A view of the gorge. Actually, for most of Italian history, Matera existed as an isolated community of troglodytes (literally, a tribe of cave dwellers). In the 1950s, the Italian government relocated the population to nearby modern developments. The city, then impoverished, was disregarded for decades. But the caves and hidden rock churches remained. In the early 1990s, after being declared a UNESCO World Heritage site, a small group of developers interested in albergo diffuso (hotel diffusion) started to incorporate urban planning with preservation. Sextantio went for what they call extreme restoration when designing their hotel, researching historical elements and local materials that retain the color, texture, patina, and scent of the location. 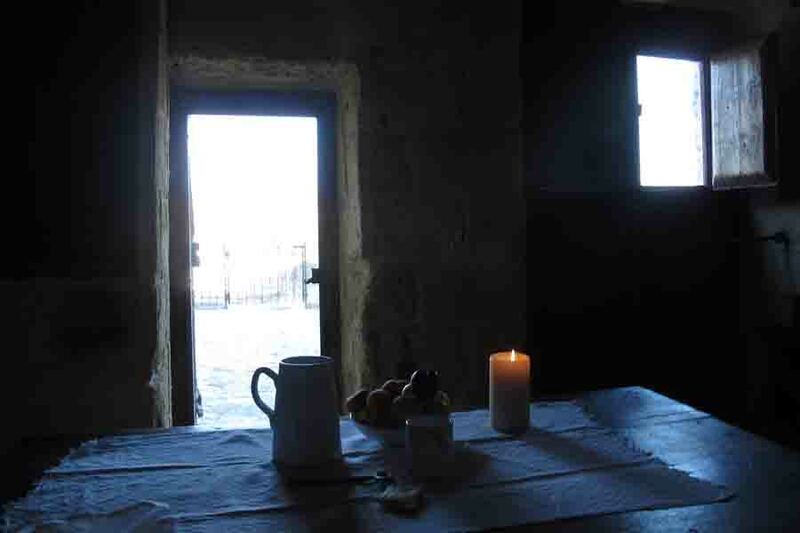 For example, breakfast is served in a nearby deconsecrated cave church from the 13th century, lit only with candles. Rustic cereal grains, local fruits, fava beans, and wrapped scamorza cheese harken back to antediluvian times. 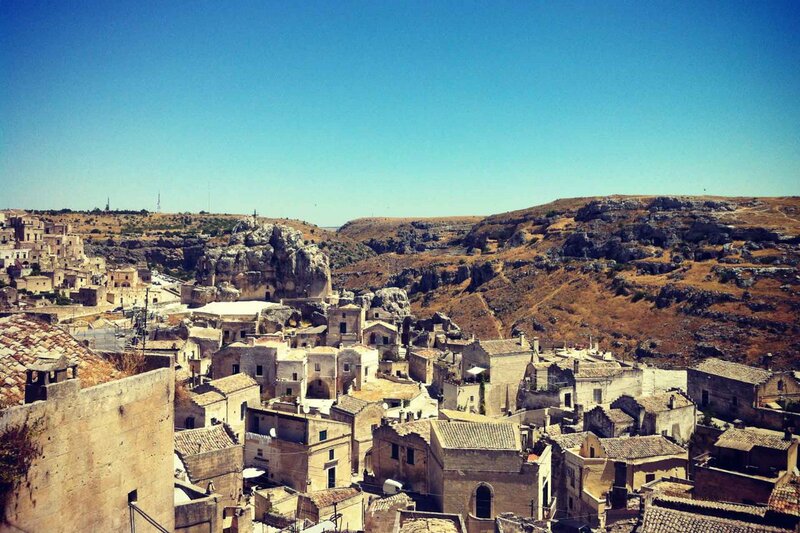 Matera was isolated for so long that many of its recipes have not changed since the Ancient Roman era. The Wi-Fi, though, is new. 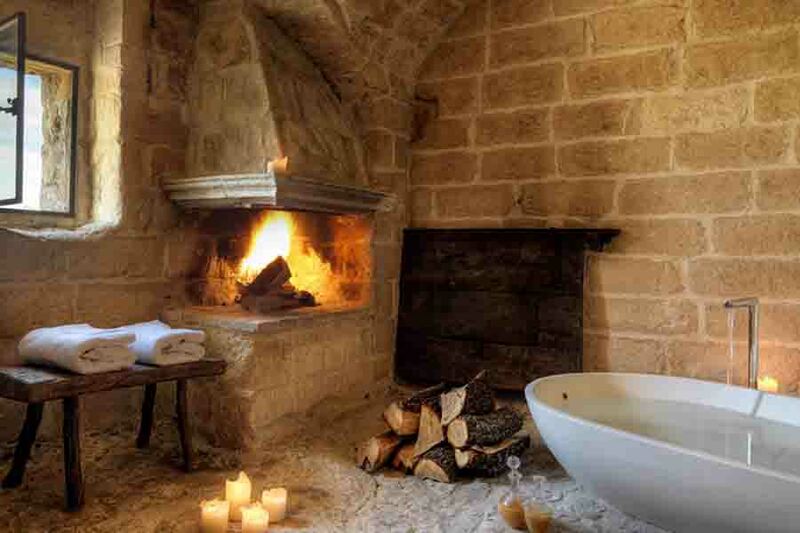 A rustic still life (above), and a bath at Le Grotte della Civita. When we arrive midday, the city is deserted. It feels and smells like another time. Remarkable. Our room is one of nearly two dozen caverns and grottoes clustered on one side of a hill overlooking the gorge. We take cool baths, snack on fresh plums, and wait for the city to wake. Everyone emerges from their caves for evening passeggiata. Grandmas and grandpas, young families, flirting teens, and us. We fall in love with the local dish, orecchiette with tomatoes and freshly shaved horseradish. We drink wine on the street. 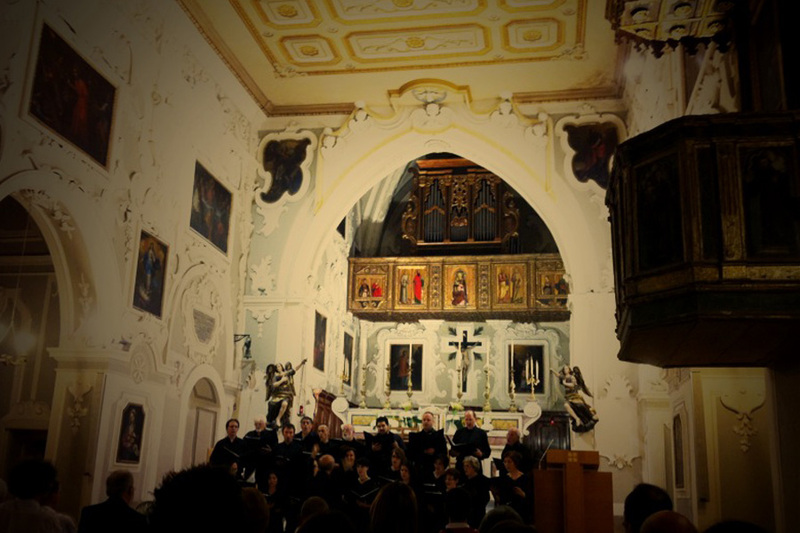 We walk in on a choral performance at a church, spy on a concert in a piazza, and stay up late, remarking how cool the locals seem to be. Turns out Matera has long been associated with the arts — there's a classical school and opera program and a generally young, creative vibe. Over the course of the weekend, we explore hidden passages, dip into cave studios, tool around the striking (also in a cave) and return, several times [a day], to i Vizi degli Angeli for artisanal gelato. We buy picnic provisions at the butcher shop and peruse the antiques at the morning markets. We follow the sounds of a practicing string orchestra, only to have the conductor peer out the balcony window and invite us to watch inside the practice room. Every street corner feels like a film set, every piazza a stage, every character a part of the theatrics. The whole weekend is a great play. 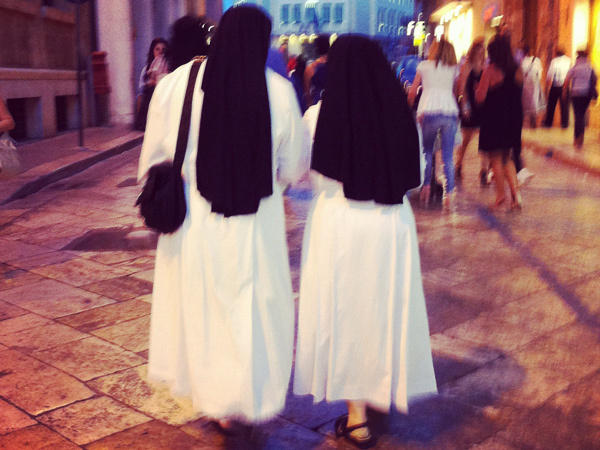 Nuns on an evening stroll (above), and an evening choral performance.